That's it. I'm done. Bye bye Deezer. I gave it several chances. A lot if I think about it. The competition right now is brutal, and the catalog is almost identical in every service. The social factor of Spotify is fantastic, but it just recommends artists, not albums, songs or playlists. Apple music had the worst UX a couple of months ago, so bad that I don't want the give it a second chance. Google Play has the broader catalog of them all, but the IOS app is a POS. My relationship with Deezer has been messy. 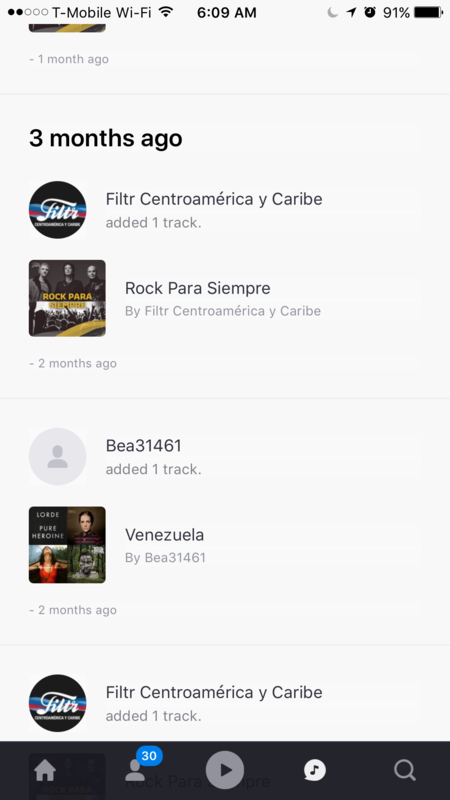 There is a recurrent bug that disappeared some downloaded albums from the folder. The songs are there, but for some strange reason I have to search the album again to get the app to rediscover the downloaded albums. Pretty annoying, and there wasn't a single competent customer service agent that could get me a solution, or even a simple explanation. [Note: If I have a 128GB Iphone, and I am paying for a service just to have the chance to download songs to the device, there is not even acceptable to suggest me to delete the app, lose all my downloads, redownload the app just to start reprogramming the app and start downloading everything once again. Hell no]. 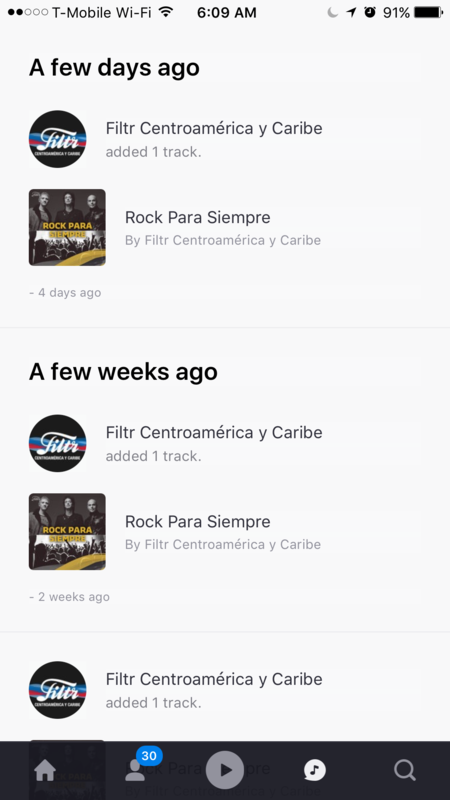 But there was a feature, just one feature that made Deezer different that the rest. Just one. It was the recommendations algorithm. It recommended albums, songs or playlists according to my playing selection. Something so simple, and ironically so unique. Now that feature was removed in the last update. The button just morphed into a changes feed. If I added, even by mistake, a playlist as a favorite (frickin' heart icon) now I get an update of changes in that playlist. Not even the song that was actually added, just a general notification. If I try after that to delete the playlist, I'm still getting the notifications of that particular playlist. There's not even an option to disable that feature. Oh, by the way, all the recommendations disappeared. So, with this post I am just saying bye bye. There were several years of a marriage that are about to end. The relationship is not working anymore. Chances were given, but responses were terrible. There are a lot of options in the market, and I think is time to move on and start giving second chances, not because they are doing something to earn them, but because there is no point to continue paying for this terrible service. So long. I'm exporting my +3000 favorite songs somewhere else. I'll let everyone know as soon as I know more! Regarding the recommendations: We just revamped our notifications section and you should see all recommendation under the new notifeed. This includes new releases of your favourite artists, recommended playlists etc. -About the downloaded albums: that explanation doesn't work for me. If I reached a limit, why I am still able to retain some new albums in the downloaded folder? I didn't say that all albums disappear. This is completely random. Some are still there, some disappear. And about the "move albums to playlists". Don't get it. That doesn't work for me. Just fix the bug and that's it. By the way, why are you putting limits to the accounts?. If I just want to download 10000 albums and playlists with 5555 songs, am I not paying for a "premium account"?. That doesn't make sense. -About the updates issue: There you have two screenshots. Help yourself. A complete mess. All recommendations, gone. Regarding the missing albums issue, I don't thing I have all that many albums added to my favorites. What happens is that Deezer, without any notification, warning of any kind, or understandable reason, removes albums from the catalog. This happened to quite a few and I can name Out of Nowhere, Meltdown from Vinnie Moore. Yngwie Malmsteen albuns are also unavailable. Unfortunately, we cannot add our albums to the list due to limitations I find ludicrous. Also, my uploaded MP3's cannot be added to My Favorites list. I have to add a new playlist, unnecessarily. That's why I loved My Favorites. ALL my preferred music is in there, and my uploaded MP3 should also be, as they are not usually available in the catalog for whatever legal reason you have. It's not a cheap service when added to all the bills we need to pay to have quality internet with a max download limit. It's not Deezer who decides to remove the albums, the artists and their distributors do...Usually when they decide to remove, they do it from all streaming services Your mp3 stays in your mp3 list, but you can add them in other playlists too. Favourite tracks limited to 2.000 and Hear This gone - without any warning: Bye, Bye Deezer! What is the best tool to export all the details of Deezer to another platform? Thanks for feedback. Just letting you know that a while ago the limit was 1000 . Deezer upgraded it to 2000 . Hear this is gone for improvements . I do agree they needed to keep in on until the updated version will be available and I also ask from them to check with the team . You can use https://www.mooval.de/ to transfer your data .